Soap, this is something special. 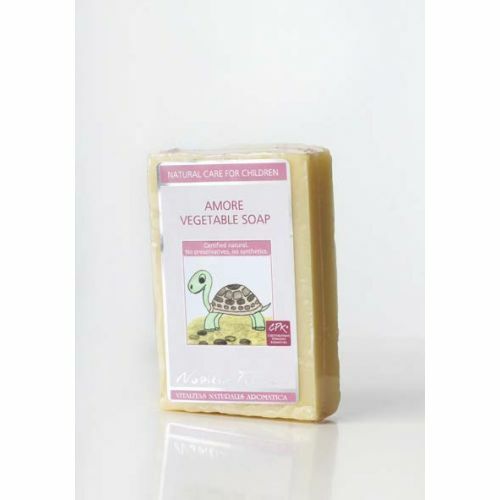 Amore Natural vegetable soap is produced in the traditional way from natural oils, suitable for a child’s more delicate skin. Amore is a loving soap and with its natural herbal composition meets the extra demands of children’s skin cleansing and moisturising. It also contains essential oils in a balanced blend designed to enhance the wash time and bed time experience, with its soothing actives it helps process everyday events making for a calm mood. Citrus aurantium amara leaf oil The common name for this popular essential oil is Petitgrain. One of the classic ingredients of eau-de-cologne. Petitgrain oil has a woody and at the same time a floral smell. The oil is distilled from the leaves of the bitter orange tree. Petitgrain is a particularly good relaxant, soothing to the nervous system and antispasmodic. Its anti-inflammatory properties make it useful against acne with antioxidant and antimicrobial properties. Citrus nobilis oil Mandarin oil contributes a happy, uplifting feeling through its cheery smelling essential oil. Especially useful for fractious and tired children. Soothing for nervous conditions and calms emotions. Elaeis guineensis oil Palm Oil has a high vitamin A and vitamin E content. These first serve as a powerful source of antioxidants which fight free radicals that cause damage to the skin; more over it can help repair damage that has already done to the skin, and prevent further damage. Also it serves as a great solution to soften old scars and even stretch marks, leaving skin looking fresher and younger. Over time, using regularly people who suffer from skin diseases such as psoriasis and eczema will find relief. Prunus armenaica kernel oil Commonly referred to as Apricot Kernel Oil, this oil is pressed from the kernels of the apricot fruit. It is rich in essential fatty acids, which are vital components of the human organism. As a result, this nourishing oil helps to replenish and rebuild the skin. The essential fatty acids found in the oil make for a good emollient or moisturizer. Emollients coat the skin, holding onto moisture so skin stays hydrated. Sodium cocoate Sodium cocoate is actually just the technical term for a simple product made from coconut oil. It is the basis of soap making. Saponification, is the process of breaking down a fat or oil by combining it with an alkali which makes soap. The process produces glycerin and the alkali salts of the fatty acids present. Sodium cocoate is the salt (hence the "sodium" part of its name) formed by breaking down coconut oil (the "cocoate" part). Sodium hydroxide Most people would know this as caustic soda. It is a widely used alkali and commonly helps make soap. Sodium oleate Made from olive oil. It come from soap making. Saponification, is the process of breaking down a fat or oil by combining it with an alkali which makes soap. The process produces glycerin and the alkali salts of the fatty acids present. Sodium oleate is the salt (hence the "sodium" part of its name) formed by breaking down olive oil (the "oleate" part). Sodium palmitate Palm oil is the most commonly used species in making vegetable based soaps and detergents. Palm oil is combined with an alkali which makes soap. The process produces glycerin and the alkali salts of the fatty acids present. Sodium palmitate is the salt (hence the "sodium" part of its name) formed by breaking down palm oil (the "palmitate" part). Thymus serpillum oil An essential oil from the ‘creeping’ thyme plant with anti-bacterial and anti-fungal activity.